Last week we expanded our enterprise storage coverage with flash arrays and today the coverage continues with Tegile's announcement of the T3600 and T3700. To bring everyone up to the speed, let's start with a brief introduction of the company. Tegile was founded in 2009 by Rohit Kshetrapal, Rajesh Nair, Justin Cheen and Alok Agrawal and operated in stealth mode until 2012. The founders share a history at Perfigo, which was a developer of packaged network access control solutions that was acquired by Cisco in 2004. As a result Tegile's expertise lies in the networking and connectivity aspect of the array, and hence Tegile provides both hybrid and all-flash arrays. SanDisk and Western Digital (i.e. HGST) are strategic investors in the company, which guarantees Tegile access to the latest SSDs at competitive prices. Currently all Tegile's arrays use SAS SSDs, for which SanDisk and HGST both have extensive lineups, but as the industry moves towards PCIe Tegile will be making the transition as well. Tegile is already evaluating some of Fusion-io's PCIe SSDs now that the company is under SanDisk, but there are no finalized plans for a product yet. The T3600 and T3700 are additions to Tegile's all-flash arrays and bring smaller capacity points to the lineup. The existing T3800 started at 48TB raw, but Tegile told me that many customers were looking for something around 10-20TB in capacity and the T3800 was too beefy (read: expensive) for that. The T3600 and T3700 have 9.6TB and 24TB of raw flash respectively, which can be extended by using expansion shelves. The expansion shelves are basically just a bunch of drives that connect to the array and use its logic, but it should be kept in mind that the shelves are their own units and thus eat up rack space. 2U and 4U expansions are available with the T3600 and T3700 having support for either four 2U (ESF-10/25/50) or two 4U (ESF-145) expansions. The maximum effective capacity is achieved with two ESF-145 expansions that are 144TB each and a 5x multiplier from compression and de-duplication, which Tegile claims is the typical increase in usable capacity. Obviously, the actual multiplier depends on the stored data and some workloads are inherently more compressible than others, so the 5x multiplier is merely an ideal guideline. The T3400 is different from the rest in the sense that it supports the HDD-based 72TB ES4000 expansion shelf, whereas the other T3000 series models don't. The reason lies in the architecture as the T3400 utilizes a pool of very low latency SSDs (likely SLC-based) that are used for metadata handling. The way Tegile handles metadata is actually one of its core advantages because Tegile stores the host and meta data separately, which is essential for efficient data de-duplication and also prevents the metadata from fragmenting. The usage of lower latency SSDs in the T3400 makes sense because all the meta data IOs need to be offloaded from the HDDs, but since that is not a problem with the rest of the T3000 lineup, high density eMLC SSDs are used in other models. All drives in the array are Self Encrypting Drives (SEDs) with AES-256 support. On the connectivity side, all T3000 series models have 14 1Gbps Ethernet ports with two of them dedicated to management. Additional connectivity options include dual-port 4/8 Fibre-Channel, 10Gbps Ethernet and quad-port 1Gbps Ethernet. Protocol support includes iSCSI, FC, NFS, CIFS and SMB protocols. 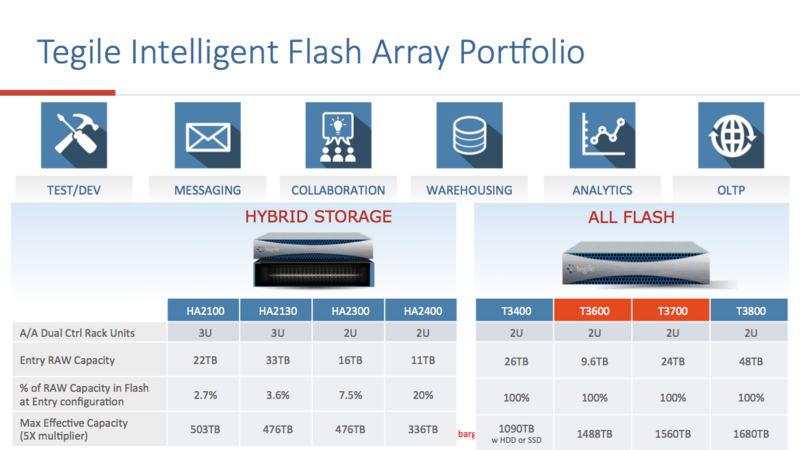 Along with the T3600 and T3700 releases, Tegile has updated its IntelliFlash OS to 3.0. 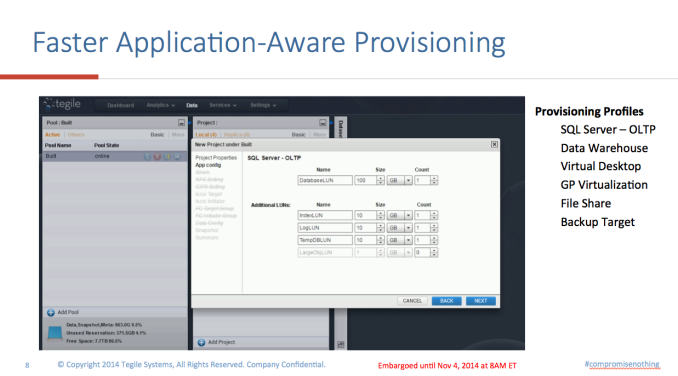 The provisioning process has been streamlined and the provisioning profiles have been enhanced. The idea behind the provisioning profiles is to give IT administrators an easy way to set up provisioning based on the workload because not all IT administrators necessarily understand the complex storage architectures and what is the optimal provisioning for their workload. 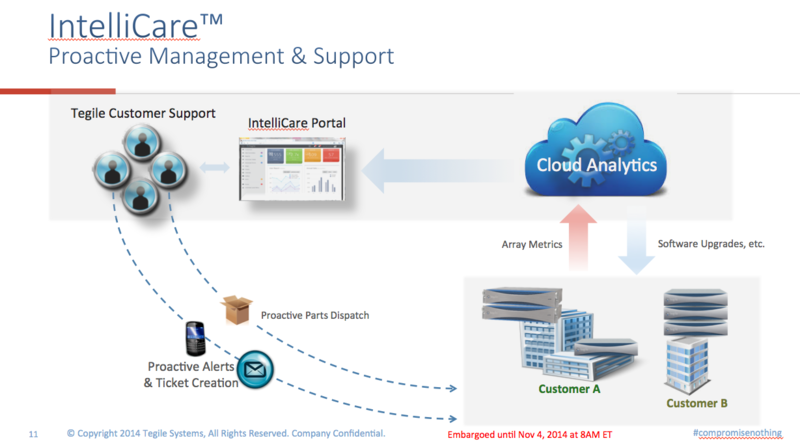 Tegile is also releasing cloud-based IntelliCare customer support, which automatically collects various data points from the array and sends them to Tegile's servers for analysis. The analysis allows Tegile to inform the customer about any potential component failures or other issues, and what's interesting is that Tegile customers can view metrics of another customer's Tegile array. Hence IT administrators can compare their array against other Tegile arrays in the wild and can see if there are any settings that could be toggled for more optimized performance. The T3600 and T3700 are both available now and start at $220,000 (~$23/GB) and $300,000 ($12.50/GB) respectively. First , Let me say thank you to everyone for letting a bad post go wild and validating everything the industry and myself our seeing . Obviously there are many factors involved , but the new guys on the block like Tegile are offering a much more attractive product then the BIG boys in today's storage world .